The Black Death persecutions and massacres were a series of violent attacks on Jewish communities blamed for an outbreak of the Black Death in Europe from 1348 to 1350. As the plague swept across Europe in the mid-14th century, annihilating nearly half the population, Jews were taken as scapegoats, likely because they were affected less than other people. Accusations spread that Jews had caused the disease by deliberately poisoning wells. The first massacres directly related to the plague took place in April 1348 in Toulon, France, where the Jewish quarter was sacked, and forty Jews were murdered in their homes, then in Barcelona. In 1349, massacres and persecution spread across Europe, including the Erfurt massacre (1349), the Basel massacre, massacres in Aragon, and Flanders. 900 Jews were burnt alive on 14 February 1349 in the "Valentine's Day" Strasbourg massacre, where the plague had not yet affected the city. Many hundreds of Jewish communities were destroyed in this period. Within the 510 Jewish communities destroyed in this period, some members killed themselves to avoid the persecutions. There are many possible reasons why Jews were accused to be the cause for the plague. One reason was because there was a general sense of anti-Semitism in the 14th century. Jews were also isolated in the ghettos, which meant in some places that Jews were less affected. Additionally, there are many Jewish laws that promote cleanliness: A Jew must wash his or her hands before eating bread and after using the bathroom, it is customary for Jews to bathe once a week before the Sabbath, a corpse must be washed before burial, etc. In many cities the civil authorities either did little to protect the Jewish communities or actually abetted the rioters. Pope Clement VI (the French born Benedictine, Pierre Roger) tried to protect the Jewish communities by two papal bulls (the first on July 6, 1348 and another 26 September 1348) saying that those who blamed the plague on the Jews had been "seduced by that liar, the Devil" and urging clergy to protect the Jews. In this Clement was aided by the researches of his personal physician Guy de Chauliac who argued from his own treatment of the infected that the Jews were not to blame. Clement's efforts were in part undone by the newly elected Charles IV, Holy Roman Emperor making property of Jews killed in riots forfeit, giving local authorities a financial incentive to turn a blind eye. As the plague waned in 1350, so did the violence against Jewish communities. In 1351 the plague and the immediate persecution was over, though the background level of persecution and discrimination remained. Ziegler (1998) comments that "there was nothing unique about the massacres." 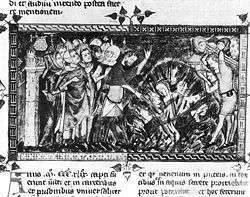 20 years after the Black Death the Brussels massacre (1370) wiped out the Belgian Jewish community. Though told for nearly 350 years, there were no written accounts of the Black Death through Jewish tales until 1696, by Yiftah Yosef ben Naftali Hirts Segal Manzpach in the Mayse Nissim. Yuzpa Shammes, as he frequently was referred to, was a scribe and shammash of the Worms community for several decades. Although his stories tell of Jews avenging themselves on their oppressors by setting fires and killing members of the city council, recent findings have shown these "wishful thoughts" were merely tales representing the view that "Jews were not always 'led as lambs to slaughter.'" His neo-lachrymose view has intent to show that the Jews were not idle but that they took action against inevitably becoming the scapegoat. Yet, as it may seem that the Jews fought against the massacres, there are contradicting accounts that explain that there was no evidence of "armed resistance." These contradicting tales display the effect of oral tradition being manipulated to fit certain circumstances. Because they were not written down for many centuries, these tales might not convey the original story or message set forth by Yuzpa. "Ordinary folk hated the Jews because they had served the merchants and aristocrats, and with their loans and with their capital, helped establish urban economy and the city's governing political and territorial independence. Further, the Jews had exploited artisans 'with loans at usurious rates.'" These reasons gave the "ordinary folk" the motive to kill the Jews because they were gaining political and social standings. Breuer also included that "others ... saw the massacres as the revenge of impoverished debtors against privileged elite of Jewish creditors." They used their crediting and loaning endeavors as a platform for earning revenue and gaining social, as well as, political status. A result of this was jealousy and an increase in anger towards the Jews because the common folk had an existing hatred for the Jews as it was. 1 2 "Blaming the Jews for the Black Death Plague". www.sixmillioncrucifixions.com. Retrieved 2016-06-09. 1 2 "The Black Death". www.jewishhistory.org. Retrieved 2016-06-09. ↑ Anna Foa The Jews of Europe After the Black Death 2000 Page 146 "There were several reasons for this, including, it has been suggested, the observance of laws of hygiene tied to ritual practices and a lower incidence of alcoholism and venereal disease"
↑ Richard S. Levy Antisemitism 2005 Page 763 "Panic emerged again during the scourge of the Black Death in 1348, when widespread terror prompted a revival of the well poisoning charge. In areas where Jews appeared to die of the plague in fewer numbers than Christians, possibly because of better hygiene and greater isolation, lower mortality rates provided evidence of Jewish guilt." ↑ Anna Foa The Jews of Europe after the black death 2000 p. 13 "This was the context in which the Plague made its appearance in 1348. THE BLACK DEATH The Plague was not unknown in ... The first massacres took place in April 1348 in Toulon, where the Jewish quarter was raided and forty Jews were murdered in their homes. Shortly afterward, violence broke out in Barcelona and in other Catalan cities." ↑ Codex Judaica: chronological index of Jewish history; p. 203 Máttis Kantor - 2005 "1349 The Black Death massacres swept across Europe. ... The Jews were savagely attacked and massacred, by sometimes hysterical mobs — normal social order had ..."
↑ John Marshall John Locke, Toleration and Early Enlightenment Culture; p. 376 2006 "The period of the Black Death saw the massacre of Jews across Germany, and in Aragon, and Flanders,"
↑ Joseph P Byrne, Encyclopedia of the Black Death Volume 1 2012—Page 15 "Anti–Semitism and Anti–Jewish Violence before the Black Death .. Their attention to personal hygiene and diet, their forms of worship, and cycles of holidays were off-puttingly different." ↑ Howard N. Lupovitch Jews and Judaism in world history p92—2009 "In May 1349, the city fathers of Brandenburg passed a law a priori condemning Jews of well poisoning: Should it become evident and proved by reliable men that the Jews have caused or will cause in the future the death of Christians,..."
↑ Getz, Faye (1998). "Book review: Inventarium sive Chirurgia Magna. Vol. 1, Text". Bulletin of the History of Medicine. 72 (3): 533–535. ↑ Howard N. Lupovitch Jews and Judaism in world history p92 2009 "On July 6, 1349, Pope Clement tried to curb anti-Jewish violence by issuing a papal bull. Its effectiveness was limited by the Holy Roman Emperor Charles IV, who made arrangements for the disposal of Jewish property in the event of a ..."
↑ Philip Ziegler The Black Death 1998 "The persecution of the Jews waned with the Black Death itself; by 1351 all was over. Save for the horrific circumstances of the plague which provided the incentive and the background, there was nothing unique about the massacres." ↑ The Shengold Jewish Encyclopedia Mordecai Schreiber—2011 "In 1370, after the Black Death, the brutal Brussels Massacre wiped out the Belgian Jewish community"
↑ David Abraham, Tales Concerning Persecutions in Medieval Germany, 1977. "Yuzpa's narrative has been noted as one example, among others, of how medieval Jews were not always 'led as lambs to the slaughter.'" ↑ Die Chronik des Mathias von Neuenburg, 1955. "While a Christian chronicler reports that during the pogrom of March 1, 1349, the beleaguered Jews of Worms set fire to their own houses, as may have happened elsewhere, there is no evidence of armed resistance." ↑ The 'Black Death' and Antisemitism, 1998. "Ordinary folk hated the Jews because they had served the merchants and aristocrats, and with their loans and with their capital, helped establish urban economy and the city's governing political and territorial independence. Further, the Jews had exploited artisans 'with loans at usurious rates.'" ↑ Samuel K. Cohen Jr. The Black Death and the Burning of Jews, 2007. "others ... saw the massacres as the revenge of impoverished debtors against privileged elite of Jewish creditors."